Pyrrhon are playing in Leeds tonight alongside Department Of Correction, but I'm unable to go. Writing a review is the next best things I suppose! 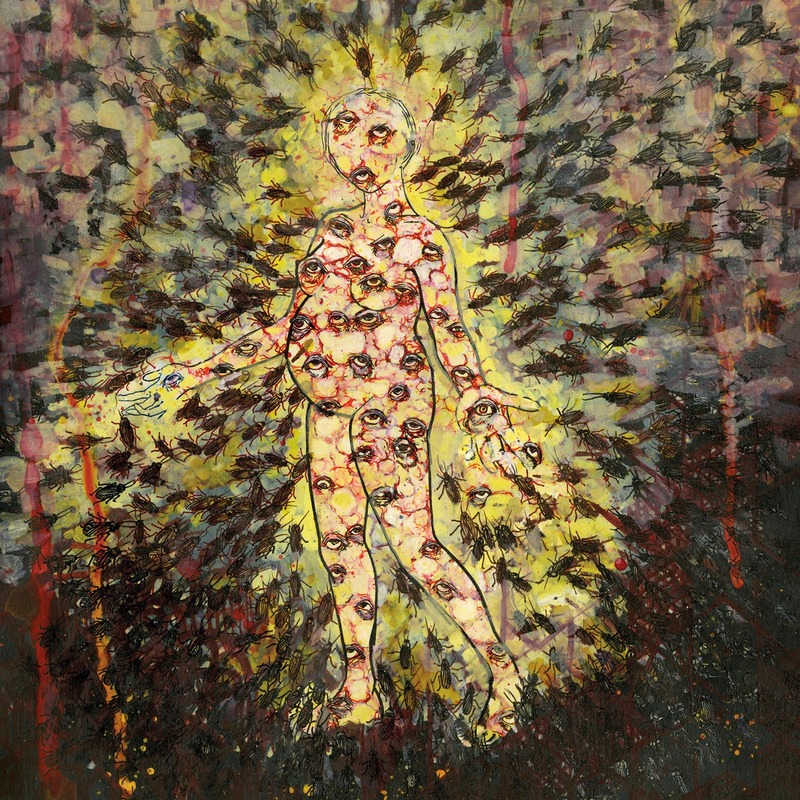 Pyrrhon, from Brooklyn NY, released The Mother Of Virtues via Relapse Records in early 2014. They've been lauded in the extreme metal music press for their forward thinking death metal, in the vein of scene-legends Gorguts and newer bands like Ulcerate, but seem to have gone over a lot of people's heads. They're due to release a new album in June so there's no better time to check them out properly. I wasn’t expecting that kick to the face! Most bands begin with an atmosphere building intro, but Pyrrhon just go for it with opening track The Oracle Of Nassau. It’s utterly chaotic, with flailing riffs, pummelling double-bass and crazed screams. A mix of grind and weirdly jangling guitar makes it very engaging, even for such a short track. On White Flag the pendulum swings completely the other way. Pyrrhon start with a sludge-laden slow build. Menacing bass and guitar melody go hand in hand alongside their off-kilter arrangements. The feedback that accompanies the vocals hits a terrifyingly satisfying spot, though they’re used sparingly and don’t take over from music itself. The expansive nature of White Flag will either have you surrendering or will drag you deeper into the mad-cap grinding collage of sound that they create. I’m only two-tracks into this so far but already it’s hammered home just how far-reaching and technically impressive this “primitive” genre of music can be. I used the speech marks because some people just don’t understand the work and passion that goes into creating an album like this and just write it off as noise. I pity those people. Sleeper Agent condenses the power of White Flag before it, halving the song-length but not the ideas. If you can follow the amount of time-changes in this, you’re a better person than me though! They seem to ratchet up the intensity on Balkanized. It’s impossible not to be moved by the contents of this album, especially if you enjoy metal on a higher plane. The instrumental mid-section of the song needs to be appreciated as it is and it’s great that Pyrrhon let it breathe on it’s own. There are intricacies in it that won’t be picked up when coupled with the vocals. Slowing the pace again, Eternity In A Breath (which is a very apt title for the song) ploughs its own sorrowful furrow. Anyone who really listen to doom or sludge will appreciate the hell out of this. Sometimes, it’s better just to sit and soak up the music without thinking about what to write as it plays. I did that with Implant Fever. I shut my eyes and lay back with a clear head. The images that it painted in my mind were as vivid as the music itself. Now, I don’t use chemical coercion (unless you count alcohol) when writing reviews so for a band to do that, they have to be pretty good. Thankfully, the piledrivng intensity of Pyrrhon is that good! The bilious, rampaging vocals on Invisible Injury show Doug Moore at his best. It’s tough to compete with the music itself, but he does here. The fact that the lyrics are audible makes it more endearing as well. Invisible Injury has to be my standout track on The Mother Of Virtues. The way Pyrrhon moves between slow/mid-paces death slabs and feverishly fast grind is both joyous and scary at the same time and it’s demonstrated perfectly on penultimate song The Parasite Of Winter. Here though, they don’t change signatures at a-mile-a-minute and are more measured. They leave it till the end to unleash their biggest and in some ways, their most unholy sermon. The title-track brings to a close an album that can’t be ignored. I’ve heard from some who say that it’s ahead of it’s time. I say to hell with that notion. As with my review of Formes yesterday, music like this needs to exist in order to challenge the status quo. Pyrrhon are grabbing what we know by the scruff of the neck and are ripping it up, replacing it with something very special. Digital copies as well as CD's can be purchased from Pyrrhon's bandcamp page above.